Rick Ross and Skrillex roll out in their “Purple Lamborghini” which is the title of their Suicide Squad single. In the Colin Tilley-directed video, Rozay and Skrillex linked up with the joker, played by Jared Leto in the DC Comics film. “Purple Lamborghini” is featured on the official Suicide Squad soundtrack out now. The movie is also now in theaters world wide. 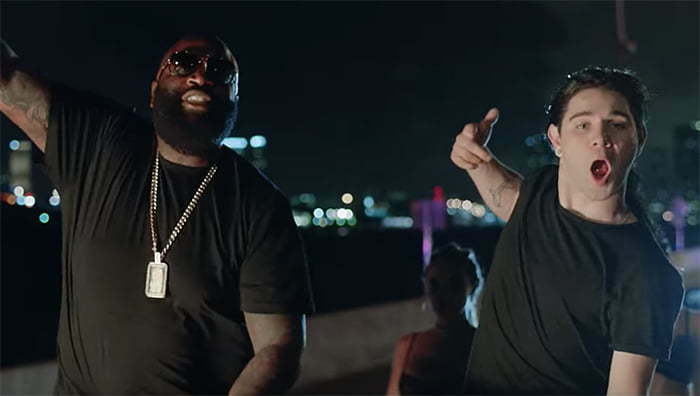 The Rick Ross, Skrillex, and Jared Leto trio are like titans in the music video with scenes of the rolling through the streets in hydraulic classic cars. Another scene overlooking the city. Perhaps the joker was the standout character after making his way to Rozay’s party on a speed boat with Skrillex. After joining the Joker’s Suicide Squad, the trio embarks on their mission but we are yet to know because that is where the video ended. Suicide Squad: The Album features appearances from Eminem, G-Eazy, Ty Dolla $ig, Kehlani, Kevin Gates, Rick Ross, and Skrillex.